The newly-elected president of the Confederation of Africa Football (CAF) Ahmed of Madagascar has thanked Egypt for its “important role” in the elections, saying he was sure that Egypt would vote for him despite the secret ballot process. “I thank Egyptians for their support. It is important to seek the support of Egypt, especially since it hosts the headquarters of the CAF,” Ahmed told Egyptian sports anchor Seif Zaher Monday during his first TV interview after his victory. Ahmad won the post in a stunning vote of 34-20 against 70-year-old Cameroonian Issa Hayatou, who had held the job since 1988. “I have an excellent relationship with the Egyptian Football Association chairman Hani Abu Rida, and he played a good role in my election victory,” he added. Abu Rida backed Ahmad against his former ally Hayatou after their relations became strained over a legal battle with Egypt's competitions authority earlier this year. “Hayatou did a lot for African football, but it is time for a change. 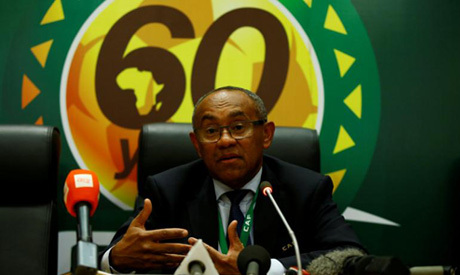 I think 10 years is enough for a CAF president,” Ahmed said. Hayatou is facing charges of violating Egypt's Competition Law in selling broadcast and sponsoring rights. Egypt maintains that since Cairo is home to the CAF headquarters, the decisions of its officials are subject to the country's laws. Egypt’s Economic Court has postponed the case against Hayatou until 6 May. “I know the confederation's problems very well. I am familiar with all its workings. I intend to implement the best management for the confederation and the all associations,” Ahmed concluded. The CAF was founded in 1957 in Khartoum by the Egyptian, Ethiopian and Sudanese football associations.